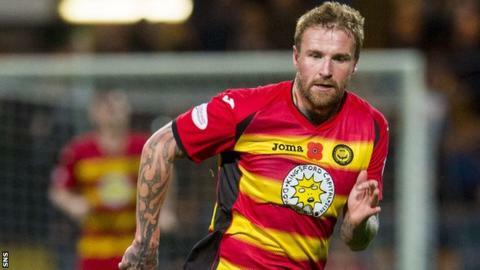 Partick Thistle forward Ryan Stevenson has joined former club Ayr United on a one-month loan. Stevenson, 31, joins an Ayr side that is six points behind Scottish League One leaders Dunfermline Athletic, but with a game in hand. He has also played for Hearts and Ipswich Town and scored 30 goals in his first spell at Somerset Park. "There really is nobody else I want to play for," he told Ayr's official website. "I have always wanted to come back and I knew I would at some point it was just a question of when. "I knew the manager had been watching me and I had to weigh up what would be the right thing to do. "It's no secret how much this club means to me and I just want to get out there and help us catch Dunfermline. "I've been to plenty of the games this season so I know there is a lot of quality in the squad and I hope I can add to that. "It's an initial 28-day loan and I just want to play games and then take it from there." Manager Ian McCall added: "Ryan wouldn't have dropped down leagues for any other club. Sometimes you hear of a player who supports this club or that club, however he genuinely loves Ayr United. "That wasn't the reason I signed him though. Ryan is not at the tail end of his career and I have watched him many times this season and it's for his ability as a footballer that I have got him here. We have a small squad here and Ryan can play in many different positions across midfield and up front. "One thing I think we have done really well is give our supporters players that they can relate to and this is another one. We have him on a 28-day loan and are very hopeful of enticing him to stay for longer."